The NBA Development League has been around since 2001 and for most of that time was known as the D-League. But this past summer, Gatorade and the NBA began a partnership, and one result of that is the circuit is now known as the NBA G League. Once you get past the name, the league is actually quite interesting and entertaining and well worth following for hoophead and sports travelers. There are now 26 teams, each either owned by or affiliated with a single NBA franchise. Most clubs play in nearby suburbs or towns (the Oklahoma City Blue are the only one that plays in the same city as the parent) and provide quality basketball at affordable prices. 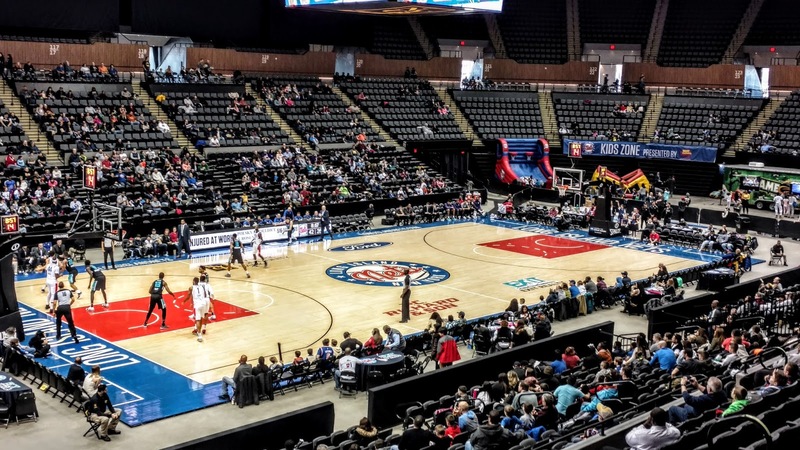 The Long Island Nets are just such a club, and after a season at the Barclays Center, they moved out to the renovated Nassau Coliseum, where they are finishing up a successful campaign. I decided to visit for their last home game of the regular season, a Sunday afternoon affair against the Greensboro Swarm, affiliate of the Charlotte Hornets. I checked TicketMaster and found a special offer: free tickets! Somehow, you could select a single seat without paying a dime - no fees either. I am not sure if that was a bug, but whatever the case, I "bought" a ticket and headed over. The only problem with Nassau Coliseum is that it is far from the city - on a good transit day, at least 90 minutes from where I live. Long Island Rail Road is the fastest option but even then, the stadium is 2.5 miles from the closest station, Hempstead Transit Center. Trains were running only hourly and although buses are available, they are unreliable, so I grabbed a Lyft for $10, arriving just a couple of minutes before game time. There was a surprisingly long line at the ticket window, making me thankful that I had bought in advance as I walked in with no waiting. Unlike the NBA, where tip-off is usually 10 minutes after the scheduled start time, this one got underway right at 3:00. I had visited here just a month prior for the New York Open, and obviously things hadn't changed much. The court is in the middle of the floor with five sections on either side that provide excellent views. With capacity of 13,500, the arena is too big for the league (only Wells Fargo Arena in Des Moines and Cox Convention Center in OKC are larger) and so the upper bowl is blocked off. Even then, the place appears empty despite a good crowd of 2,644 for Fan Appreciation Day. You can pretty much sit anywhere and I moved down low for the first quarter, which is all I really needed to see. 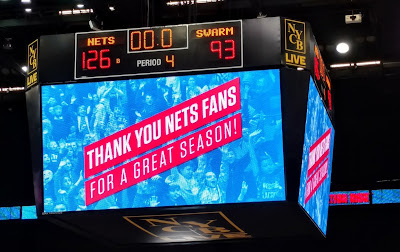 The Nets scored the first 8 points, pushed the lead to 29-12, and Greensboro, last in the league at 15-31, never got closer than 13 after that. To make matters worse, 54 fouls were called over the length of the contest, which made it go much longer than it needed to. 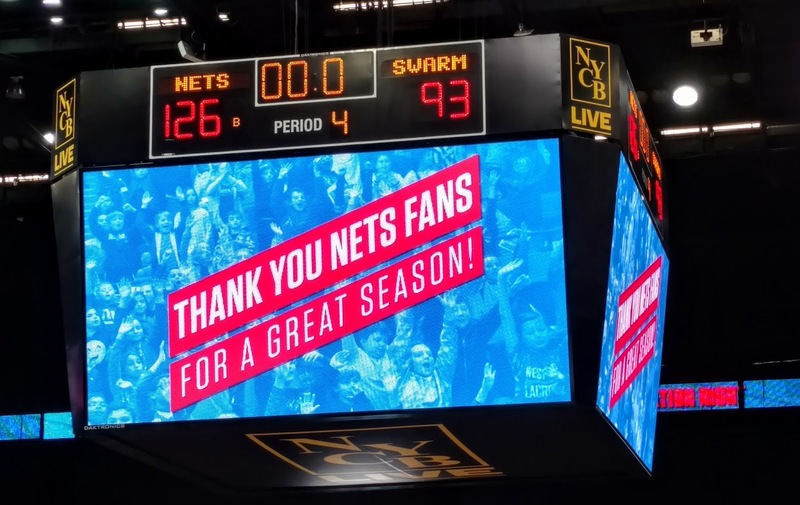 The final was 126-93 with Isaiah Whitehead, a Brooklyn native who spent all of last season in the NBA, the star with 26 points in just 24 minutes on the floor. As the game took over two hours to complete, I wasn't able to catch the 5:13 train out of Hempstead. With an hour until the next one, I decided to walk back to Hempstead, which took about 40 minutes and is an option to consider if the sun is shining and it is not too cold. The top six teams in each conference make the playoffs and with a 26-21 record and three road games remaining, Long Island is tied for 5th with Grand Rapids. Defending league champions Raptors 905 are currently 4th in the playoff picture, but only a 1/2 game behind Westchester for top spot in the Atlantic (the three division winners are seeded 1-3), so they might end up hosting the Nets in a single elimination game in a couple of weeks. Update: Long Island lost their final game to Grand Rapids and missed the playoffs, but that is overshadowed by the tragic death of Grand Rapids player Zeke Upshaw who collapsed near the end of that game. He was taken off the court on a stretcher and died two days later. Hempstead is the terminus of the Hempstead Line on the LIRR, with the other end being Atlantic Avenue, where the Barclays Center is located. This certainly presents some opportunities for doubleheaders should the schedules align. A shuttle bus from the station would help even more. The four NBA teams without a G League affiliate are Washington, Denver, New Orleans, and Portland. 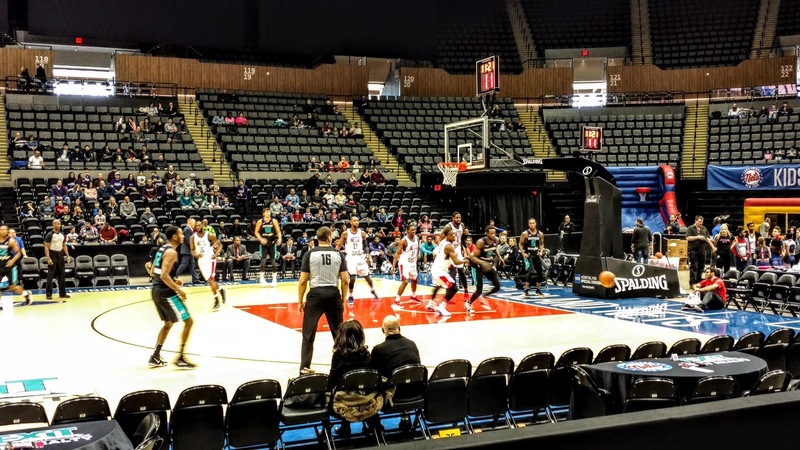 Starting with the 2018-19 season, the Capital City Go-Go will begin operations as the Wizards affiliate, while the other three teams are expected to eventually field squads, thus making the circuit a true minor league. Hmm, G League road trip anyone? A day trip to Montreal on Saturday, where I plan to see an AHL/NHL doubleheader featuring the Laval Rocket and the Canadiens. Recaps will be posted next week.